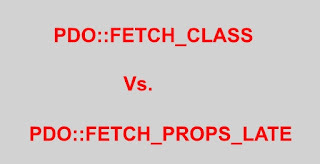 In our last post we have discussed about PDO::FETCH_CLASS, from which I think you are able to build complete understanding on PDO::FETCH_CLASS. 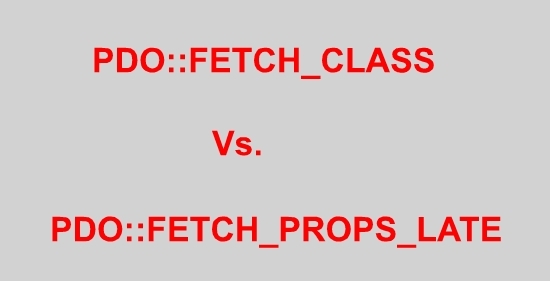 But in this post we are going to discuss about few shortcomes about PDO::FETCH_CLASS. Lets see the below example for PDO::FETCH_CLASS. If you have clearly observe the code and their corresponding output, Then you can find the shortcomes. In this above example we are trying to retrieve username from database (e.g. $user->getUSERNAME() ) and our end result for username is same for all, but in this database values are different. So the reason is that the data is populated into the object first, and then the constructor is called. Here constructor overwritten the same values every time. In some situation we may require to call constructor first and then setting the values to object. So in that case we need to use PDO::FETCH_PROPS_LATE. Basically it overcomes the problem of PDO::FETCH_CLASS. Lets see the below examples, where we are retrieving values PDO::FETCH_PROPS_LATE mode.